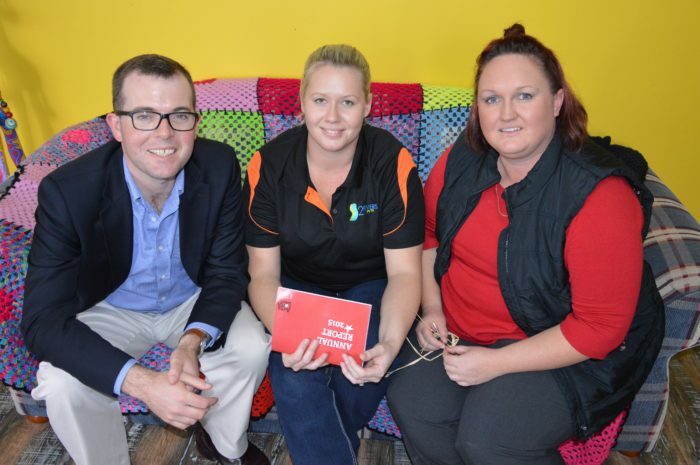 Northern Tablelands MP Adam Marshall, left, with Arts North West Project Manager Pene Riggs and Arts North West Aboriginal Arts Officer Lorrayne Riggs. The region’s artists will be given insights into the traditional art of Anaiwan and Kamilaroi people through a new project being run by Arts North West. Member for Northern Tablelands Adam Marshall today announced a $15,000 grant to support Arts North West in its efforts to open up understanding and appreciation of Aboriginal art and culture in the region. The funding will be used by Arts North West to send four Aboriginal artists to cultural workshops and training at the Australian Museum in Sydney. Mr Marshall said this training would help the artist work with other local artists to help them better understand the traditional methods employed by the Anaiwan and Kamilaroi nations. “The NSW Government acknowledges the important role art plays in Aboriginal culture,” Mr Marshall said. “Through the Aboriginal Regional Arts Fund, we want to create opportunities for Aboriginal artists, arts workers, communities and audiences. “I’m proud to see money invested in a vibrant and distinctive Aboriginal arts and cultural sector, supporting local artists in our region to tell the stories of their communities. Arts North West Aboriginal Arts Officer Lorrayne Riggs said the project being funded – *Making Old Markings New* – would provide expert guidance for local artists while allowing ongoing resources to be developed for other Aboriginal artists. “The Anaiwan and Kamilaroi artists in our region will benefit from the outcomes of the workshops at the Australian Museum and rock art sites,” Ms Riggs said.